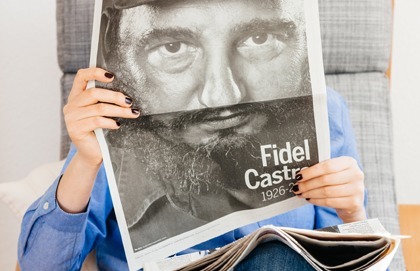 Fidel Castro, the Cuban dictator, haunts me still. He haunted me during his life. He haunts post-mortem as I read about the injustices he spread. There can be no dispute: Castro ruled Cuba as a tyrant. He murdered and stole and viciously repressed opposition. And he never could have done it alone. In studying the history of totalitarianism, this is the part that gets me. The many spies, henchman and supporters who make it happen; who clap at the rallies, who cry out for the great leader, who spy on their neighbours. We like looking back in history to identify the heroes. We read the stories of Ann Frank, The White Rose, Corrie Ten Boom, Father Maximilian Kolbe and Dietrich Bonhoeffer. We read their stories now knowing they were right, silently admiring the stand they took. Another righteous Gentile, Irena Sendler, hid Jewish children in Nazi-occupied Poland. Had she been caught, retribution would not have been only against her, but against her whole family. Entire towns (Lidice, Czech Republic) were razed to the ground for the opposition of the few. If we look at the numbers, the Righteous Gentiles, the obvious dissenters, are the minority. The numbers of quietly-going-along-to-get-along folks are numerous. And the numbers of those actively supporting the evil tyranny are somewhere in between. Canadians have every opportunity to speak our minds. If I am afraid of voicing an unpopular opinion here, would I ever be able to stand up and oppose real tyranny? My parents escaped communism in Czechoslovakia at the tail end of Prague Spring in 1969. This was their opposition to the regime. It doesn’t mean those who stayed were supporters. The opposite is true. My grandfather’s business partner went to jail for saying the wrong things and emerged a broken man. My great uncle joined the Party and lived fairly comfortably until Communism fell. We all have our limits, and evil regimes have a way of breaking people. Castro’s tyrannical rule lasted over 50 years. Communism in Eastern Europe lasted just under that. The question I have is not about whether Castro was a tyrant (he was) or how he ought to be eulogized. My question is for myself. If faced with a crisis would I recognize it? And if I recognized it, what would I do? Cuba, Czechoslovakia, the Eastern Bloc, the Third Reich: the people living there were not different from Canadians today. These are modern, western cultures and the people living there had hopes and dreams, fears and aspirations. I know my own weaknesses and I know the opposition I do not mount to injustices around me today in peaceful, free Canada. I choose security. I choose getting along. I choose the appearance of influence in the “right” circles. Castro didn’t “succeed” in his dark rule alone. He had the help of many. Unless we entirely ignore history, we do not all get to play the role of the courageous opposition. Some of us help the tyrants.